SOUTHINGTON - For the Southington girls basketball team, Tuesday night was painfully familiar. As they have been the past three games, the Blue Knights were in position to claim a much-needed win to keep their state tournament hopes alive, but a frenzied fourth quarter saw RHAM come away with a narrow 54-50 victory, dealing Southington its third straight loss, all of which have come by four points or less. Falling to 5-12 for the season, the Blue Knights must now win all three of their remaining games to qualify for the postseason. A back-and-forth final period highlighted by an electric shooting performance from Brianna Harris was eventually not enough, as RHAM’s Marisa Lee and Jaclyn Santella proved to be too much down the stretch. The two Sachems finished with 17 and 18 points on the night, respectively. Harris finished with 15 points for Southington, all coming from beyond the arc. 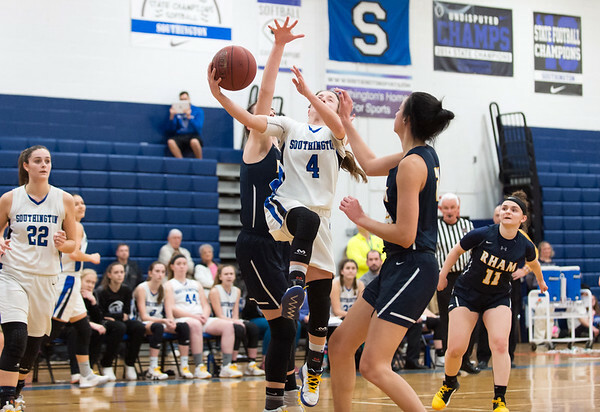 Her three triples in the opening three minutes of the fourth quarter kept Southington in position to win, but go-ahead buckets from Santella and Lee in the final two minutes deflated the Blue Knights’ comeback hopes. The Blue Knights took the lead twice in the early minutes of the fourth quarter, both on Harris threes, but missed free throws and late turnovers doomed their chance of closing out the win. Harris finished with 15 points, all on 3-pointers. Southington was unable to extend its lead after Harris’ 3-point barrage, and with two minutes left in the game, Santella knocked down a pull-up jumper to give RHAM the lead back. Livvy Pizzitola tied the game 40 seconds later, but Lee grabbed the lead back for the Sachems with a go-ahead layup with just 50 seconds to go. The Blue Knights looked to tie it on the next possession, but turned the ball over and were forced to intentionally foul and watch RHAM (9-9) ice the game at the free throw line. “Our turnovers really killed us,” Harris said bluntly. The Blue Knights held a seven-point lead after the first period thanks to a 14-4 run to end the quarter, with Harris leading the way with a pair of 3-pointers. Southington maintained its lead through the first half thanks to strong defense from Kelley Marshall, who pulled down four rebounds in the second quarter and blocked two shots in the same possession early in the period, shortly after knocking down a pair of free throws on the offensive end. The Blue Knights continued strong on defense in the third, but the offense suddenly faltered, misfiring on multiple attempts at the rim and missing three free throws as the Sachems drew closer. The open looks to Marshall suddenly closed, and aside from the hot hand of Harris, offense was hard to come by. Marshall finished with 15 points to lead the team along with Harris, but the majority of her production came in the first half. RHAM: Samantha Freeman 4-3-11, Jaclyn Santella 7-4-18, Marisa Lee 7-3-17, Harleigh Roach 0-2-2, Julia Hancin 0-4-4, Megan Lukowski 1-0-2. Totals: 19-16-54. Southington: Brianna Harris 5-0-15, Livvy Pizzitola 4-2-10, Kristen Longley 4-0-9, Kelley Marshall 4-7-15, Sam Sullivan 0-1-1, Megan Mikosz 0-0-0. Totals: 17-10-50. Three-point goals: Harris (S) 5, Santella (R) 2, Longley (S) 1. Records: RHAM 9-9, Southington 5-12. Posted in New Britain Herald, Southington on Tuesday, 5 February 2019 20:42. Updated: Tuesday, 5 February 2019 20:45.